Ottawa was the next stop on our big adventure. We arrived in Ottawa mid-afternoon after a four and half hour drive from Toronto. We settled into our Airbnb accommodation, which was small but perfectly fine. If you’d like, use this link to sign up with Airbnb and we’ll both get some money toward our next stay! We decided to wander into town and see if we could find the Notre Dame Cathedral. 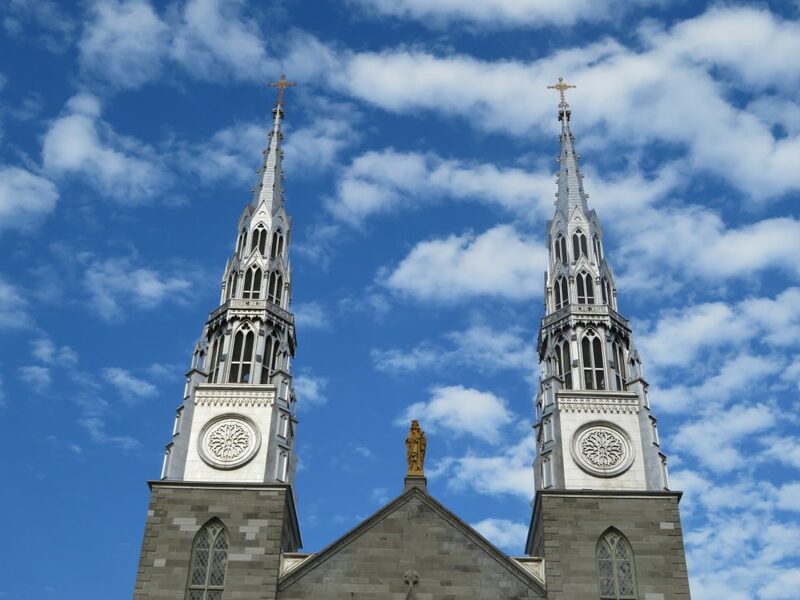 The oldest standing church in Ottawa, it is the seat of the Roman Catholic Church of Canada. When we arrived, a Mass was taking place. In French! Our friends headed across to the National Gallery of Canada to check it out, but I slipped in and was able to participate in the Mass. 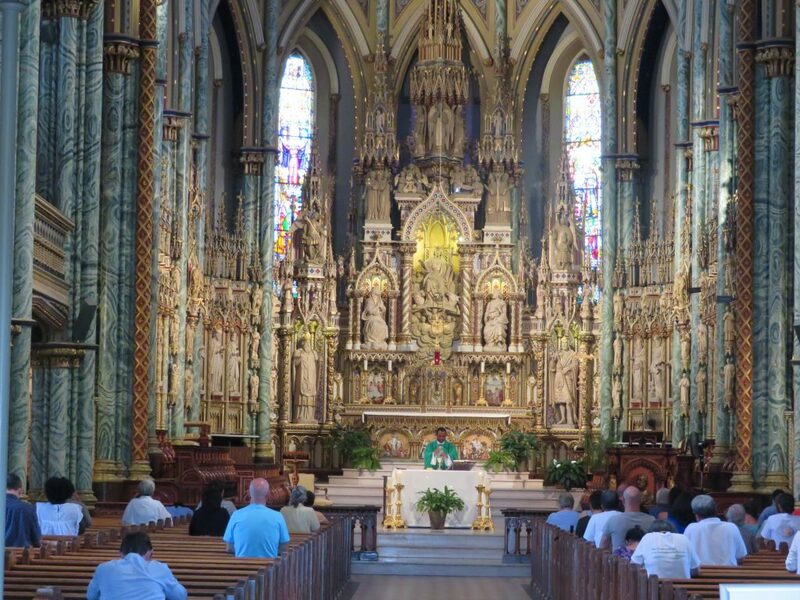 While I don’t speak French, every Catholic Mass around the world is the same, so I was able to easily pick up on what was going on and join in the Eucharist. It was a pretty cool experience. 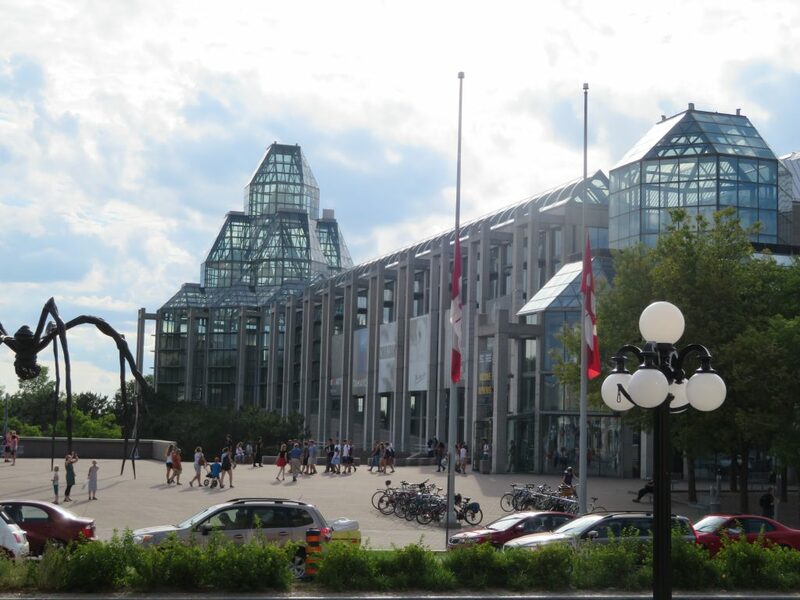 We headed over to the National Gallery of Canada to find our friends and stumbled across a Picasso exhibit. Poopsie and I really enjoy art, so we immediately entered and enjoyed looking at many of Picasso’s early sketches. The kids were not as interested, so our friends headed off for an early dinner and we met them back at the accommodation. Almost the entire gallery is free of charge, with only occasional exhibits having an entry fee. We only really checked out the Picasso exhibit and we also got to spy on a still life drawing class happening at the same time. The gallery is enormous so there is plenty to do for kids and adults alike. The next day, we embarked on a four hour bike tour with Escape Bicycle Tours. Our guide, Chris, took us all around Ottawa. Check out this video Poopsie shot (I’m the one in the white shirt directly in front of the camera). The bike tour was a little pricey, but we both agree it was worth it. We did the four hour tour which cost $99 for adults and $89 for children. They provide you with a bottle of water and a snack (a muesli bar on our tour). 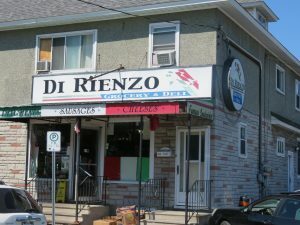 We stopped for lunch in Little Italy at a really nice hole in the wall deli called Di Rienzo Grocery and Deli. The food was very affordable and absolutely delicious, one of the best meals we had in Canada. If you ever go to Ottawa, track done this place and buy some lunch! 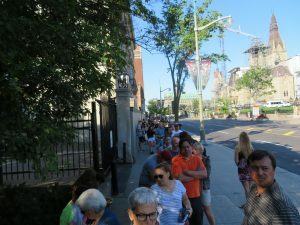 That morning, the guys had lined up to get tickets for a tour of Parliament. 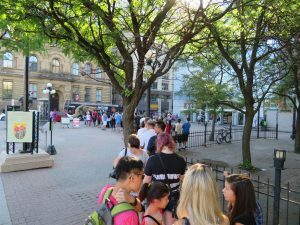 The tours are free, but only a certain number of tickets are given each day, so you need to get there early as the lines are long. The line in one direction. The line in the other direction. The tours were great. 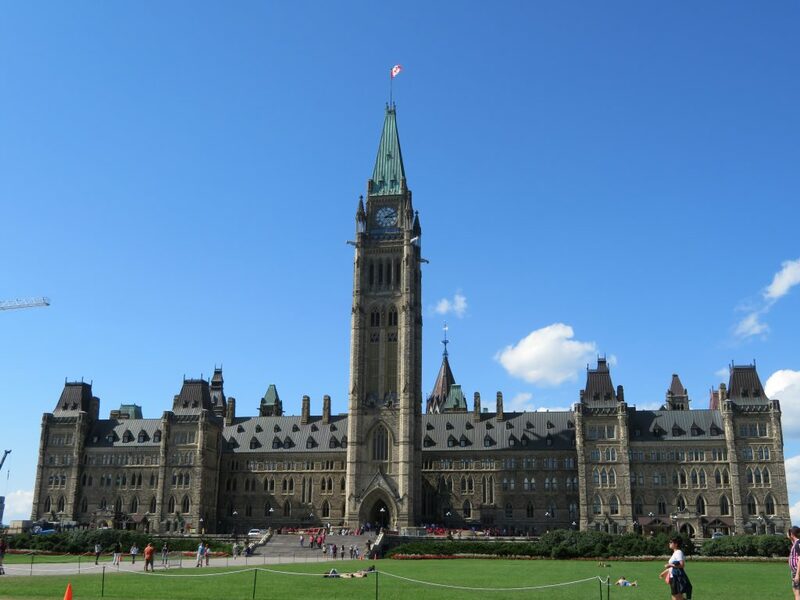 The Centre Block was our favourite, as it is home to the Senate, House of Commons and the amazing library. We really liked Ottawa. To begin with, we thought it seemed a bit boring but the more we explored it, particularly on our bikes, the more we saw the beauty and fascination with it. 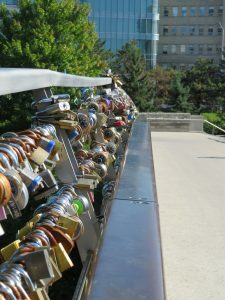 A bridge of locks in the heart of Ottawa. If we were to go back to Canada, I think we would return to Ottawa. It is the capital, and thus there is so much to see. We highly recommend you pay it a visit! 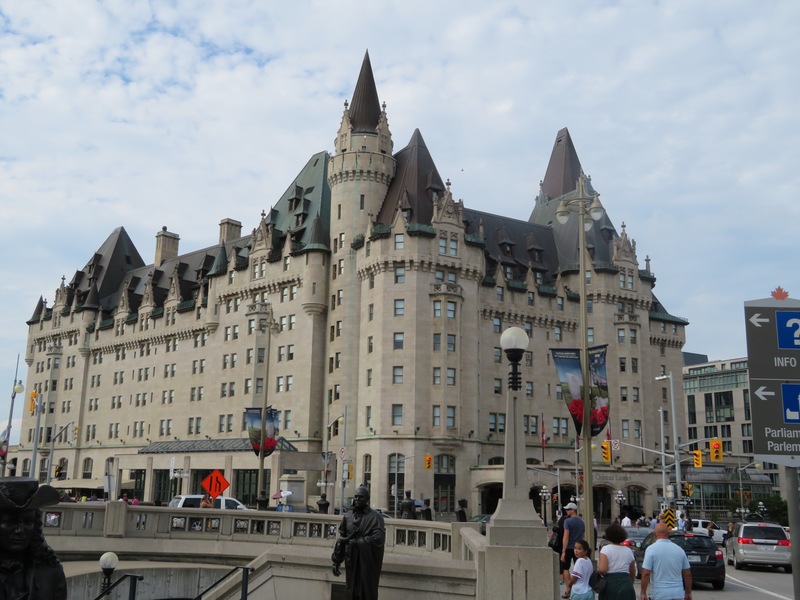 Have you ever been to Ottawa? What did you think of it? *all prices listed are in Canadian dollars. The photos are excellent, we really do want to go. The inside of the Notre Dame Cathedral is incredible. Is that a sculpture of a gigantic spider outside of the National Gallery? But I’m convinced it’s a tripod from War of the Worlds (it even had a little basket for carrying humans) but after asking around, no-one seemed to even get the reference. But I think I’ve started a movement on it, the tour guide was going to use that from now on. Yep. They had a similar sculpture out the front (back?) of the Guggenheim in Bilbao back in 2006. It could be the same one and it got moved or maybe it’s a replica. Looks like it was stunning weather for you as well!